Rizin Fighting Federation has announced the signing of former UFC interim champion Shane Carwin. The 41-year-old fighter will return to action for the first time since 2011 in the second round of the Openweight Grand Prix on New Year’s Eve week. 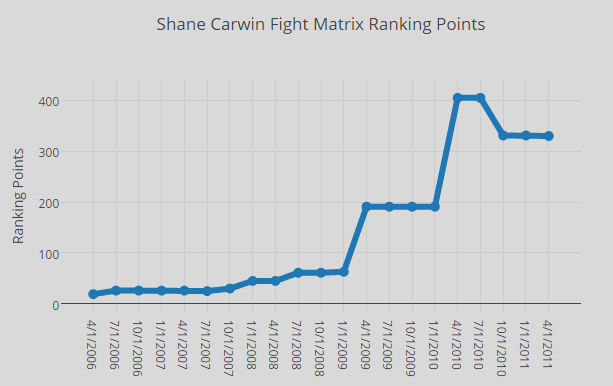 Carwin first earned a spot in the Quarterly Generated Historical Rankings 2006 and stayed there until his retirement. His peak ranking, #4 heavyweight, came in April 2010 after he defeated Frank Mir for the interim belt. Carwin was last ranked #6 heavyweight April 2011. Of the remaining fighters in the tournament, only Mirko “Cro Cop” Filipovic and Wanderlei Silva have higher peak rankings. However, Filipovic’s peak came in 2007 and Silva’s in 2005.